Nystatin, still produced today under various trade names, not only cures a variety of potentially devastating fungal infections, but has also been used to combat Dutch Elm disease in trees and to restore artwork damaged by water and mold. Rachel Fuller Brown was born on November 23, 1898 in Springfield, Massachusetts to parents George Hamilton Brown, a real estate and insurance agent, and Annie Fuller, a director of religious education. They later moved to Missouri where, at the age of fourteen, Brown’s parents separated and her father left the family with almost no money. So her family of three moved back to Springfield. Upon the family’s return to Springfield, Rachel enrolled in Commercial High School, but her mother forced her to transfer to Central High School for a more traditional education. Brown’s hard work and determination to go to college impressed Henriette F. Dexter, a friend of her grandmother, who decided to pay for Brown to attend Mount Holyoke College. Though she originally chose to major in history, she fell in love with chemistry, a strong field at Mount Holyoke, after taking a required science course taught by Emma P. Carr. Brown earned her B.A. in chemistry and history in 1920. After working as a laboratory assistant for some time, Brown eventually began her graduate work and earned an M.S. in organic chemistry from the University of Chicago in 1921. She then taught for three years at the Frances Shimer School near Chicago, a school and junior college for girls (now known as Shimer College). After taking some language courses and chemistry at Harvard, Brown returned to the University of Chicago for additional graduate work in organic chemistry and bacteriology. After successfully completing her research project and the required course work in 1926, she submitted her Ph.D thesis. However, due to some complications in scheduling her oral examinations and the depletion of her savings, Brown was forced to leave Chicago without her Ph.D to find a job at the Division of Laboratories and Research in Albany, New York. The Division of Labororatories and Research, a major arm of the New York Department of Health, was famous for its research of human disease-causing agents and the creation of antiserums and vaccines. There Brown worked for seven years without her Ph.D until her return to Chicago for a scientific meeting, at which point Brown arranged to take her oral examinations and was awarded her Ph.D.
At the division’s laboratory, Brown focused on identifying the types of bacteria that caused pneumonia, helping develop a pneumonia vaccine still in use today. Additionally, she researched ways to improve the test for syphilis. However, the antibacterial and antifungal work that she is best known for did not begin until 1948. During this year, Brown embarked on a project with Elizabeth Lee Hazen, a leading authority on fungus and bacteria related research. The project would eventually bring the two scientists national recognition for discovering an antibiotic to fight fungal infections. Penicillin had been discovered in 1928, and in the years that followed, antibiotics were increasingly used to fight bacterial illness. However, one side effect was that these antibiotics allowed for a rapid growth of fungus, which could lead to sore mouths or upset stomachs. Other fungal diseases without cures including infections attacking the central nervous system, athlete’s foot, and ring worms were also a major problem during this time. However, fungal diseases were not well understood at this time, and there were no antifungal medications safe for human use. At this time, people knew of microorganisms called actinomycetes that lived in soil and were known to produce antibiotics, some of which killed fungus. However, these antibiotics also proved fatal in tests involving lab mice and thus could not be put into production. The successful partnership between Hazen in New York City and Brown in Albany was due in part to the efficiency of the United States Postal Service in the 1940s. In her New York City laboratory, Hazen cultured organisms found in soil samples and tested their ability to fight against two fungi: Cryptococcus neoformans, a fungus responsible for the chronic disease cryptococcosis, which affects lungs, skin, and other body parts like the central nervous system, and Candida albicans, which causes candidiasis, which can be minor in some cases (e.g. a vaginal yeast infection), or a serious infection in patients treated with broad-spectrum antibiotics. If she found such promising antifungal activity in a particular culture, she would mail it to Brown in a mason jar. At her end, Brown isolated the active agent in the culture, or the ingredient in the soil sample that could potentially be used to cure these fungal diseases. This was before the days of high-performance liquid chromatography and other separation techniques and required meticulous labor as well as a great deal of patience and painstaking attention to detail. After isolating the active ingredient, Brown would return the sample to Hazen in New York, where it was retested against the two fungi. If effective, the toxicity was then evaluated in animals. Nearly all the agents that killed the test fungi also turned out to be highly toxic to animals, signifying that they could not be safely used for human treatment. Of the hundreds of soil samples sent to Hazen and Brown from around the world, the one culture that was effective against fungi and not fatal to animals was originally found in the soil near a barn of two of Hazen’s friends, the Walter B. Nourses. The microorganism discovered in the soil was later named Streptomyces noursei in their honor. Brown’s chemical testing showed that the microorganism in this particular soil sample produced two antifungal substances called Fractions N and AN. Fraction N was fatal on tests with animals, just like the other substances that Hazen tested. However, Fraction AN proved safe in tests on live animals and was effective not only against the initial two fungi, but fourteen others as well. Brown then purified this second antibiotic into small white crystals. The two scientists first named the drug fungicidin, but upon discovery that the name was already in use, changed it to “Nystatin” in honor of the New York State Division of Laboratories and Research. Nystatin is a polyene antifungal drug to which many molds and yeast infections are sensitive. It was also the first antifungal antibiotic to be safe and effective in treating human diseases. Not only did it cure many serious fungal infections of the skin, mouth, throat, and intestinal tract, but it could also be combined with antibacterial drugs to balance their side effects. Over the years, Nystatin proved effective not only in fighting human diseases, but was also used to stop fungal growth on flood-damaged works of art in Florence, Italy. It also showed effectiveness in slowing the spread of Dutch Elm Disease, a fungal disease of elm trees spread by the elm bark beetle. Brown and Hazen presented their work at the National Academy of Sciences regional meeting in 1950. The subsequent report by the New York Times started a flurry of calls from pharmaceutical companies, interested in the commercial possibilities of nystatin. The pharmaceutical industry had the manufacturing capabilities and ability to test the compound on humans. However, to license the substance, control the purity, and protect the financial interests of the developers, Gilbert Dalldorf, the division director of the laboratory in which Hazen and Brown worked, assigned patent royalties to the Research Corporation of New York, a nonprofit foundation created for the advancement of science. The production license was awarded to E. R. Squibb & Sons, who developed a safe method of mass production and produced the first sale of the tablets, named mycostatin, for human use in 1954. In 1951, the Department of Health and Laboratories promoted Brown to associate biochemist. Brown and Hazen, in continuing their research, discovered two additional antibiotics—phalmycin and capacidin. The two continued to work closely together in making additional minor contributions to the field of bacteriology until their retirement. Brown died on January 14, 1980 at the age of 81 in Albany, New York. Royalties for nystatin totaled $13.4 million. 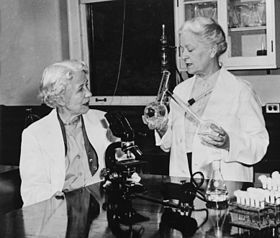 As Brown and Hazen did not want any of the money for themselves, the philanthropic Research Corporation used half for grants to further scientific research and the other half to support what became known as the Brown-Hazen Fund. Both Brown and Hazen received many awards for their collaborative work, the first major prize being the Squibb Award in Chemotherapy in 1955. Brown was also elected fellow of the New York Academy of Sciences in 1957. On Brown’s retirement in 1968, she received the Distinguished Service Award of the New York Department of Health. In 1972, she was also given the Rhoda Benham Award of the Medical Mycological Society of the Americas. Brown and Hazen were the first women ever to receive, in 1975, the American Institute of Chemists’ Chemical Pioneer Award. Brown was inducted into the National Inventors Hall of Fame in 1994. Brown was a member of St. Peter’s Episcopal Church since she first arrived in Albany. There she met Dorothy Wakerley, a woman who became her lifelong friend and companion. They shared a house, and like many other unmarried women during their time, they cared for an extended family over the years. They lived with Brown’s grandmother, mother, and various nieces as well as nephews. Brown also invited a succession of visiting women scientists from China. Brown continued her active community life in retirement, becoming the first female vestry, or administrative member, of her Episcopalian church. She also taught Sunday school for many years. Between 1957 and 1978, the Brown-Hazen Fund supported training and research in biomedical sciences and encouraged women to take up careers in science. For several years the fund was the largest single source of nonfederal funds for medical mycology in the United States. For over fifty years, Brown was also an active member of the American Association of University Women, strongly supporting the participation of women in science. By her death, Brown had not only paid back Henriette Dexter, the wealthy woman who made it possible for her to attend college, but possibly more important, the money she earned from royalties allowed her to create new funds for scientific research and scholarships to provide other scientists with the same opportunities. ^ "Rachel Brown and Elizabeth Hazen". Science History Institute. Retrieved 21 March 2018. ^ "Rachel Fuller Brown Biography". Encyclopedia of World Biography. Retrieved 29 November 2016. ^ a b c d e f g Wayne, Tiffany (2011). American Women of Science Since 1900. Santa Barbara, CA: ABC-CLIO, LLC. pp. 262–263. ISBN 9781598841589. ^ "Rachel Fuller Brown Biography". Encyclopedia of World Biography. Retrieved 2 March 2015. ^ "Rachel Fuller Brown The Antifungal Drug Nystatin". Lemelson-MIT. Retrieved 29 November 2016. ^ "Gallery | Rachel Fuller Brown". Mount Holyoke College. Retrieved 2 March 2015. "Brown, Rachel". Mount Holyoke College Archives and Special Collections. Retrieved 29 November 2016.